The Atlantis Submarine Tour has to be on the list of things to do while enjoying your Barbados vacation. 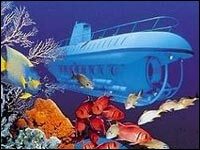 Most people aren't into diving but would love to see what's below the Caribbean Sea and the best way to find out is to take the submarine tour. Since that day I've heard many stories from friends and seen some of the amazing pictures that they had taken but I never got around to taking the tour. That changed last year when my wife's cousin (a Barbadian) came back from the underwater tour with such a great report I decided to finally go. I've known about the submarine tour from the day it was launched, I even took the time to check it out one day but like many other things just didn't get around to doing anything about it. I was pleasantly surprised at the difference from when the Atlantis was originally launched in 1987 to the way it is today, there are now two new and larger submarines that can take 48 passengers down to a depth of about 150 ft.in air conditioned comfort. After arriving at the dockside departure spot we waited for a short time before boarding the Ocean Quest which took us out to board the Atlantis sub that is waiting for the next load of excited passengers. During the short ride the crew gives a rundown on safety procedures and what to do. Try and get a seat near the front of the sub if you can just behind the captain so you can see directly ahead, but not to worry if you don't because everyone has their own porthole to look out of. The submarine tour provides a wonderful look at the huge amount of undersea life and marine environment surrounding Barbados. The sub glides over a two mile long coral reef that's estimated to be 60 feet high and over 20 million years old. We saw many schools of brightly coloured tropical fish, sea fans, sponges, sting rays, sea turtles, colourful coral formations and even a sunken ship that you would only get to see if you were a diver. Although their is a running commentary about what you're seeing If you ever have any questions about the kind of thing you might be looking at just ask and you'll get an answer from the helpful staff. And if you're not sure you'll be happy with the tour don't worry the Atlantis Submarine Tour offers a 100% money back guarantee if you're not satisfied. If everything is the same as the day we went I understand how they can make that guarantee ... because It was fantastic. 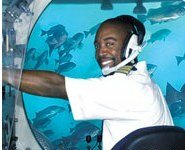 The Atlantis Submarine Tour is an enjoyable, fascinating and informative way to spend a few hours while on vacation in Barbados.